Not only can no other company dream of matching Apple’s success — every Android tablet combined doesn’t come close to knocking it off its throne. 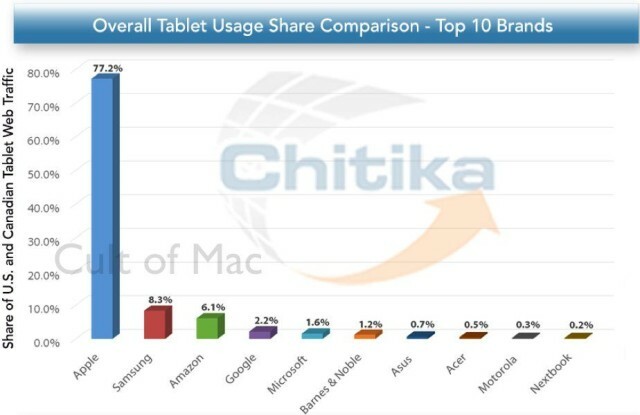 The result is what Chitika calls the “elephant in the room,” referring to the iPad’s disproportionate success. While Apple’s lead is gradually declining by a handful of percentage points each year, the fact that its closest competitor (Samsung) accounts for only 8.3% of web traffic, next to Apple’s 77.2% leaves no doubt as to who the winner is likely to be for years to come. What did we say about it being a good time to be on the Apple bandwagon?